One clue is normal. The remainder are split into three equal groups: misprints in the definition, an extra letter in wordplay or a missing letter anywhere in the clue (always providing real words). 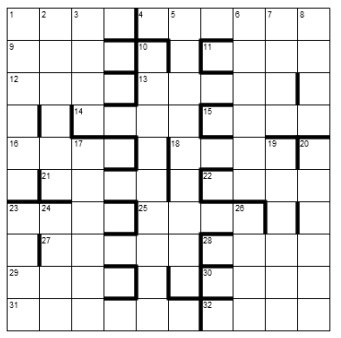 Respectively, the correct/extra/omitted letters in clue order provide an author and the title of one of his works which explains why certain characters should be removed from the initial grid wherever they occur. However, in common with the work, the season prevails (symmetrically) in the final grid to be submitted by solvers. Chambers 13th edition is recommended, but does not include one answer (in Collins). To enter this competition, send your entry as an image or in list format to ccpuzzles@talktalk.net before 8th January 2017. The first correct entry drawn from the hat will receive a book from the Chambers range, which has been donated by Chambers.